Disclaimer: DO NOT WORK ON LIVE CIRCUITS. Your power supply should not be plugged in until you have completed the construction of this SPECIFIC build CORRECTLY. Electricity can kill you, regardless of the voltage applied. 4 inch computer fan. Mine was 12 volts DC. hard drive magnets. I only used one. You can also buy rare earth magnets online from a number of vendors. 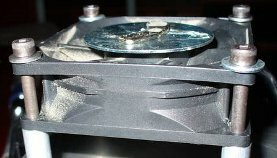 Neodymium magnets are cheap retail if you can’t find an old hard drive to scrap. 2 inch diameter steel washer. Some scrap wire will be helpful, however we’ll only need about a foot of black and red wire.